We do vary the menu from time to time and will endeavour to post updates as to the likely options……………. 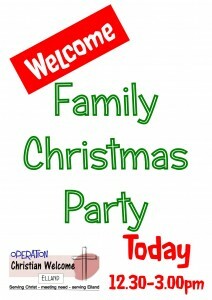 The OCWE Christmas Party for families took place on Thursday 29th December. This event has now taken place for the last 3 years and numbers have continued to increase. Last year there were 35 people in attendance, with 22 of those being children. This time we had 30 children and an overall attendance of 60. The meal was provided as a buffet and we also had party games, films and a visit from Father Christmas, who had delayed his annual post-Christmas holiday to be with us. We are pleased to announce that OCWE has received a grant of £470 from the Elland Staying Well Project, for which we are very grateful, as it takes a lot of pressure off the finances. This will now keep the project running until at least December 2017. We could still do with more help on Friday evenings from 5pm onwards if anyone is willing and available. The next Soup and Sandwich event is on Friday 27th January 2017. The Soup & Sandwich evening on 23rd October was a great success with numbers attending building steadily. The steering group met after the evening and have confirmed a further 3 dates for the Spring. These are detailed in the Calendar section on the right of this page. 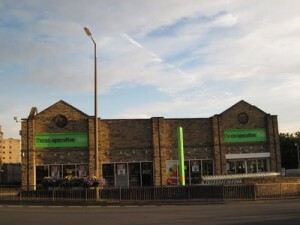 The Autumn Soup & Sandwich events have been made possible by the very generous support of the Elland Co-op. We would like to thank them for their support, both in donating the food for the event and for the help of Janet, seconded to us for the evening and a very important part of the team! Everything is set up for the next OCWE Soup and Sandwiches event at Southgate Methodists. Food will be available from 6-8pm served in the Sykes Hall (accessed from the side of the Church on Langdale Street). On Friday 25th September, OCWE held its first of a series of ‘Soup and Sandwich’ evenings. It was felt the evening was a great success, the more informal approach leading to a pleasant and relaxed atmosphere. Some ‘new’ people turned up who had not been at the previous events and they all seemed really keen to spread the word to their friends. Perhaps the most important factor about the new people was that they all had connections with Elland. The Elland Co-op were very generous in supporting the event both with a large donation of food and with support for the staffing of the event. They have also generously offered support with the October event – for this we would like to offer our thanks. Following on from the event, a meeting was held to both review the evening and plan for an event to be held over the Christmas period. It was felt that the ‘Soup and sandwich’ event should be repeated in the same format on the 2 further occasions already pencilled in, 23rd October and 20th November. Plans were also made for the Christmas event. This time it was felt we should aim the event at families, providing a buffet-style meal and entertainment, along with an appearance by a certain gentleman wearing red (as long as he is not too tired out by his work on the 25th December!) The event will be held at Southgate on Tuesday 29th December at 1pm. We are hoping the launch of the Elland Food Bank in October will provide links to families who may benefit from this event. OCWE was always intended to be a Christian response to the needs of those around us in Elland and not just the response of one church or denomination. It is a source of great encouragement to us that there are now people involved from 4 of the Elland churches and that, whilst Southgate does provide an ideal base for the events, it provides a chance for Christians to bear witness to the love of our God in really practical ways, alongside one another, regardless of tradition. All the events are at Southgate and, as always, we would ask for your prayerful support. the vast majority of whom came via the Foodbank in Halifax. This was an increase from those who attended in December. Those who attended very much enjoyed the food and the fellowship. Our seeming inability to make contact with the needy in our own community, when as Church members we are aware of need on our own doorsteps. Taking into account the areas of concern which were identified under our review of the last event it was agreed that at this stage another “full meal” type event was probably not needed and that another type of event should organised. It was also noted that only organising occasional events was probably not the way to succeed. Equally, to hold regular events was not a possibility at the present as the pool of volunteers was relatively small. It was decided that the best way forward at this stage, as there is still a great need in the Elland community, was to organise a soup and sandwich type meal, if was felt it may be more in line with the needs of the community. It was also agreed to initially organise 3 such events to try and establish some regular pattern. Only providing soup and sandwiches requires less manpower and may help with the issue of a relatively small pool of volunteers. Some of those present shared with the meeting their professional experience of working with the needy and suggested the best time to arrange an event would be early Friday evening, a day when many people find themselves too financially stretched to provide food for themselves. The dates agreed on are set out below. 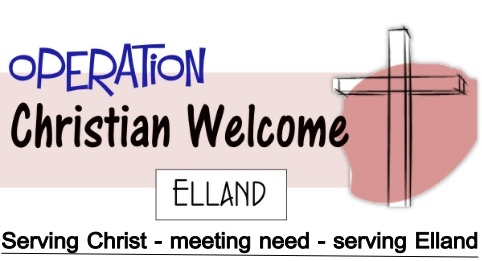 Operation Christian Welcome, although initially coming out of a vision from members at Southgate, is very much an ecumenical project and most definitely not just Methodist. It was brought to the attention of the meeting that concern was expressed by a member of the clergy at the recent AGM of Churches Together that little information was known about the project. One present at the meeting advised that she was able to brief the AGM about the current situation and our hopes for the future. The project so far has been financed by generous donations from the members of Southgate and Bethesda Churches. After holding two events we still have finance in hand to be able to pay for the soup and sandwiches events. Further appeals for donations to be put on Church notices to keep funds topped up and build up a reserve for a Christmas event which could be costly. The next OCWE Event is another Community Meal to be held on Saturday 16th May 2015. We’re now on Twitter @OCWElland! In the book of Proverbs in the Old Testament it says “where there is no vision the people perish” (Proverbs 29 v18). We want to share with you a vision that initially came from a member of the Southgate Methodist Church but is for all Christians here in Elland to share in. It is a vision of providing a Christmas meal for those in need in the 25-50 age bracket, over the festive period as a way of showing the community of Elland the Gospel of Jesus Christ in action in a practical way. This is the age group that are not generally represented in our Churches. After much prayerful thought it has been agreed that it will take place in the afternoon of Monday 29thDecember using the facilities at Southgate Methodist Church. We stress this is not a Southgate project or even a Methodist project but is an opportunity for all Christians of all denominations in Elland to come and share and work together. In 1 Thessalonians 5:17 Paul reminds us to “pray continually”. Praying is one of the most important things we can do and the starting point for all we try and do in God’s name. We invite your prayers for this project; for the people who will be involved in it, for those who will receive our Christian hospitality, for the plans that are being made and for the preparations that will take place. We appreciate that many of you cannot be physically involved in the project but your prayers will be just as valuable to us. One of the keys’ to success will be having sufficient people willing to give up their time to help. There will be many areas where we need people to help. Such as: catering, washing up, waiting on at table, a welcome team, help setting up and clearing away, a prayer team and perhaps other areas as well. Have you got skills in some of these key areas or simply feel called to come and help? You will be very welcome. The project is going to offer a traditional Christmas meal to our guests and to do that we need the provisions to put on the table. So we are appealing for either food, and we will be circulating a list of what is needed nearer the time; or donations of money to enable us to go out to purchase what we require. We appreciate that we are living in very difficult financial times at the moment but all gifts, small or large, will be very greatly appreciated. There will be an open meeting for anybody who is interested in the project on Friday 28th November at 7.30pm in the Langdale Room at Southgate. On that night we are hopeful of having a speaker from the New Ebenezer project in Halifax, where they provide a meal on Christmas Day, who will share their experience and knowledge with us. If you would like to volunteer, or offer donations or simply want further information, then please do not hesitate to contact us. There is a powerful reminder in Matthew 25 about looking after those members of our community who are in need of our support when Jesus said, “what you do for the least of these members of my family you do also for me”. Read the whole passage from verses 31-48. Living up to the challenge of those words in Matthew’s gospel is something that the Church community in Elland and we as individual Christians need to take very seriously, to take that step of faith as part of our response to the God who calls us all to serve him.